Summary: The true story of the bloodiest and most dramatic march to victory of the Second World War: the battlefield odyssey of a maverick U.S. Army officer and his infantry unit as they fought for over five hundred days to liberate Europe - from the invasion of Italy to the gates of Dachau. From July 10, 1943, the date of the Allied landing in Sicily, to May 8, 1945, when victory in Europe was declared – the entire time it took to liberate Europe – no regiment saw more action, and no single platoon, company, or battalion endured worse, than the ones commanded by Felix Sparks, who had entered the war as a greenhorn second lieutenant of the 157th “Eager for Duty” Infantry Regiment of the 45th “Thunderbird” Division. Sparks and his fellow Thunderbirds fought longest and hardest to defeat Hitler, often against his most fanatical troops, when the odds on the battlefield were even and the fortunes of the Allies hung in the balance – and when the difference between defeat and victory was a matter of character, not tactics or armor. Drawing on extensive interviews with Sparks and dozens of his men, as well as over five years of research in Europe and in archives across the US, historian Alex Kershaw masterfully recounts one of the most inspiring and heroic journeys in military history. Over the course of four amphibious invasions, Sparks rose from captain to colonel as he battled from the beaches of Sicily through the mountains of Italy and France, ultimately enduring bitter and desperate winter combat against the diehard SS on the Fatherland’s borders. Though he lost all of his company to save the Allied beach-head at Anzio and an entire battalion in the dark forests of the Vosges, Sparks miraculously survived the long bloody march across Europe and was selected to lead a final charge to Bavaria to hunt down Adolf Hitler. In the dying days of the Third Reich, Sparks and his men crossed the last great barrier in the West, the Rhine, only to experience some of the most intense street fighting and close combat suffered by Americans in WWII. When they finally arrived at the gates of Dachau, Hitler’s first and most notorious concentration camp, the Thunderbirds confronted scenes that robbed the mind of reason. With victory within grasp, Sparks confronted the ultimate test of his humanity: after all he had faced, could he resist the urge to wreak vengeance on the men who had caused untold suffering and misery? 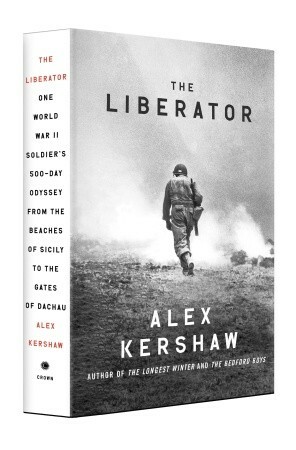 THE LIBERATOR by Alex Kershaw is a powerful novel about one man’s journey as a soldier in World War II. It details the encounters of Felix Sparks and his 157th Infantry Regiment of the 45th Thunderbird Division from the Allied landing in Sicily on July 10, 1943 through VE Day on May 8, 1945. Sparks enlisted in the U.S. Army in 1936 after failing to find work during the Great Depression. After his enlistment was up, he enrolled in college to become an attorney. His studies were interrupted by a year call-up to active duty in 1941where he served as a second lieutenant in the Thunderbird Division. Before the year was up, Sparks, like many young men, found that he would stay in the Army to fight Adolf Hitler. The military command found Sparks to be a natural leader and he advanced to Lieutenant-Colonel before the end of the war. Sparks miraculously survives World War II, finishes his law degree, faces a family tragedy and makes several significant contributions to society before his death in 2007. Author Alex Kershaw traces the 500 days of combat that thrust Sparks and the Thunderbirds in some of the fiercest fighting in World War II as the unit fought its way through Sicily, Italy, France and Germany. Kershaw’s graphic descriptions give the reader a grim reminder of the physical and emotional toll that the war placed on the U.S. infantrymen. Several hundred had been killed under Spark’s command, something that would haunt him the rest of his life. One of the most unnerving chapters of the book deals with the Thunderbirds’ march into Dachau, a main Nazi concentration camp. Kershaw follows the story from Spark’s initial receipt of an order to divert from his pursuit of Hitler and instead secure a concentration camp near the city of Dachau. Sparks had no idea what a concentration camp was. Kershaw’s description of the initial reaction of the troops upon entering Dachau and seeing the death and destruction will leave an impression on any reader. The assault on Nazi SS Troops by both U.S. soldiers and camp survivors gives the reader a stark reminder of what war can do to humans. Kershaw interjects people like Churchill, Eisenhower, Patton and Montgomery into the novel showing their roles in the war and the sharp contrast with roles of soldiers like Sparks. He doesn’t hesitate to remind the reader that petty jealousy and politics by these leaders and others prolonged the war and caused a significantly higher death toll. THE LIBERATOR is a fast paced, easy to read dramatic non-fiction novel that reminds the reader just how horrific war can be. I recommend this book to anyone who has an interest in World War II or simply likes to read about national heroes. Thanks to the publisher for providing a review copy of this book and to Booking Pap Pap for his review. I bet my dad would like this too. Just thinking about what they found in the concentration camp makes me sick to my stomach. This book sounds great! I've been wondering about this book! Great review! Although I won this book from another blog, I have yet to read it. Otherwise, I would have commented on whether I agree or disagree with this review. I'm glad to see that it's a good review, though. This sounds like a book that needs to be on the WWII list at War through the Generations. Thanks for the recommendation. I'm with Kathy, just thinking about concentration camps makes me ill. I've got it linked on War Through the Generations. I'm glad to hear it's easy to read and fast paced. It's on my shelf right now, and I need to get started on it.